Have your energy and motivation taken a nosedive? Has the fun and adventure disappeared from your life? The Mindful Reboot will guide you through a deeply renewing and healing process that will reconnect you with joy, passion and a sense of adventure in your daily life. The Mindful Meditation Intensive is for anyone who wants to make a commitment to taking up the path of mindfulness meditation. This 12-week introduction will get you established in a daily practice and will give you the guidance you need to meditate with complete confidence in your practice. You’ll learn the features of the meditative path so that you will know your “meditation goals” and be able to track your progress. Popular with those with high blood pressure or feeling the damaging effects of chronic stress, the Stress Reduction Special is a 12-week immersion in practices that will restore your physical well-being. You’ll look at all aspects of your life to find the root causes of your stress and examine all the habitual responses to stress that are contributing to your your stressed out life. You’ll learn powerful stress reduction practices that you can do at home and at work. Searching for a competitive edge in your work? Trying to chart a course to success that doesn’t leave you burned out? Looking for a career path that is financially rewarding but also in alignment with your highest sense of purpose? Mindful Business Coaching may be for you. The process begins with an assessment of where you are now and your immediate and long term goals. From this foundation, a coaching is collaboratively created. Mindfulness practices will be included as appropriate. You’ll discover a deeper sense of being “on your path,” attuned with yourself, with new tools for your adventure. Contact me to book your Coaching Package. 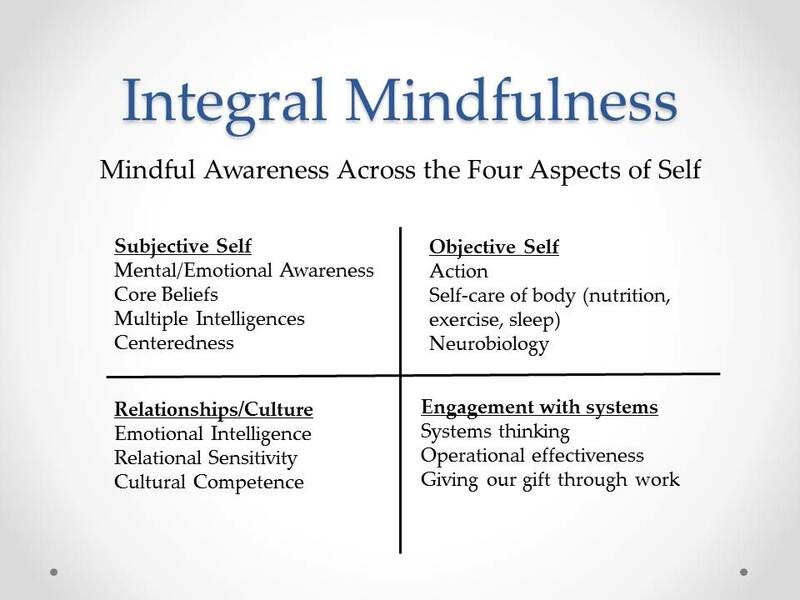 Mindfulness-based coaching is an integral approach. It looks at your life using a comprehensive map that illuminates both your strengths and your growing edges. This map helps you see yourself clearly by taking four different perspectives on your life, exploring your Self from four different viewpoints. In my work with coaching clients, we look at all four of these areas. We identify existing strengths and look for opportunities to work with the areas that have the greatest potential to unlock your emerging potential. Interested in getting started? Read my post on mindfulness meditation. I use this integral map of the Self, which looks at you from four different perspectives. This is the inner you, the subjective world of your beliefs, your vision and intention, and your multiple intelligences (cognitive, kinesthetic, interpersonal, moral, spiritual, etc). This is the place where your core beliefs about yourself – who you believe you are and what you believe about the world you live in. I help individuals to free themselves from limiting beliefs about themselves and the world and to align themselves with the truth of who they are, who they are becoming. The subjective self is also the place where we hold the stories we tell ourselves about our lives: who we are, how we came to be as we are now, and what our prospects are for the future. As with our core beliefs, so our stories can either be life-enhancing or limiting. So, I work wiht my clients to help them revisit, even rewrite theirpersonal stories. The objective self is your physical body. It’s everything about you that has form. It can be said that the physical body, your objective self, is the other side of your subjective self. Certainly, there are intimate connections between these two aspects of your self. Your body stores all the experiences of your life time. They live on here, whether stored in the brain or perhaps held in your muscles, ligaments and tendons. When we experience trauma of any kind, whether a car accident, a fall, or abuse (physical or psychological), the trauma generally becomes stuck in the body. An important part of the healing journey is finding ways to release these held traumas without having to relive the original experience (thus retraumatizing ourselves). In my work with clients who’ve experienced significant trauma, this is an important part of the work. Many of us feel that we have not experienced severe trauma, but in my experience just being alive in today’s stressful, impersonal world leaves its mark on us. Luckily, there are powerful techniques available today that can help us release trauma and heal. There are many ways to work with the physical body. Some of the most powerful sound very simple, but establishing these fundamentals to physical well-being is the first step. Contact me for a free Integral Assessment. You’ll discover your areas of greatest strength and identify your most important next steps. Get yourself back in the flow, contact me today! We are built for relationship, yet relationships can be one of the most challenging parts of life. How to be oneself in relationship? How to balance your needs with theirs? How to balance time for oneself with time for the family? How to work with others with whom we simply don’t see eye to eye? How to truly be a “good friend” to our friends and family members? How to visit with family at the holiday without getting into the “craziness” that arises? If relationships are challenging, they are also infinitely rewarding. Others help us to see parts of ourselves that we are blind to. They illuminate our blindspots and reflect our gifts back to us for us to see. I work with clients to help them develop a greater capacity for intimay in their relationships with spouses, life partners and family and better communication skills for all relationships. And for those of us who’ve had difficulty in relationships, sometimes revisiting our Core Beliefs about relationships (part of the Subjective Self) can be the key to unlocking greater enjoyment and ease in our relationships. It is in our engagement with the world that some of our most satisfying and rewarding experiences are to be found. There is nothing like seeing your personal gifts and passions engaged in creating something valuable, something that helps others live better lives. Yet, many times our experience of work is not fulfilling and our experience of the world can become more a drain than a source of inspiration! In working with clients on this aspect of Self, I want to revisit the Subject Self, you, and your passions and vision for life. I want to understand what your gifts are and what makes you light up. Do you want to help the world evolve? How? In what way, exactly? Sometimes a new career path might open up, other times what’s needed is not a new job but a new approach to the job you have. 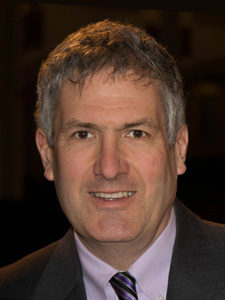 Bill Epperly, PhD © 2019. All Rights Reserved.